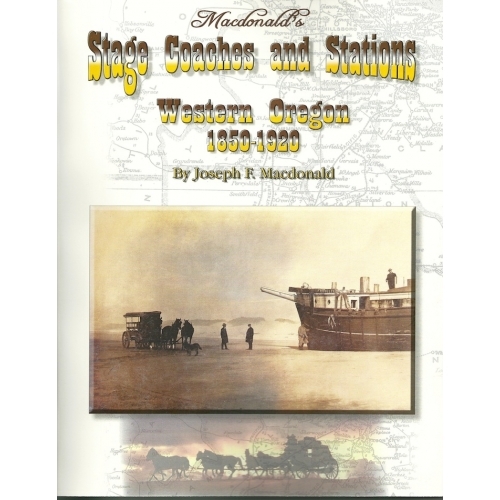 This book is Volume 2 of a pioneering effort, detailing information on the stage companies that supplied the transportation network for the widely-dispersed communities of Western Oregon. In addition to the hub locations, large towns such as Eugene, Jacksonville and of course Portland, the book lists and locates all of the small communities that benefitted from stage service, as well as the way stations that provided feed, water and a change of horses for the stage company. One of the fun things you can do with this book is to plan an itinerary to get from one place to another by stage, which could take days for a trip that we now cover in hours. Joe Macdonald has long been involved in researching the history of the Pacific Northwest and has previously published on Pacific Northwest steamboats. This stage coach book has numerous illustration of staging and stage company advertisements collected over several decades. Paperback, 190 pages, 8.5 by 11 inches.